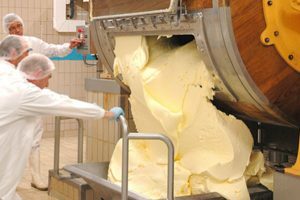 During this stage, the cream is heated in order to eliminate bacteria and germs which could affect the butter’s conservation. Making the deposits allows the milk to be enriched with milk enzymes to acidify the cream. 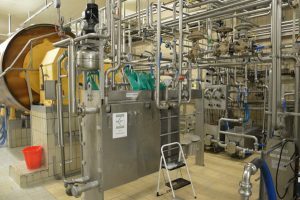 The cream is matured for 18 hours in double lined tanks: this stage is important for the butter to develop its aromas and take on a nice hazelnut taste. 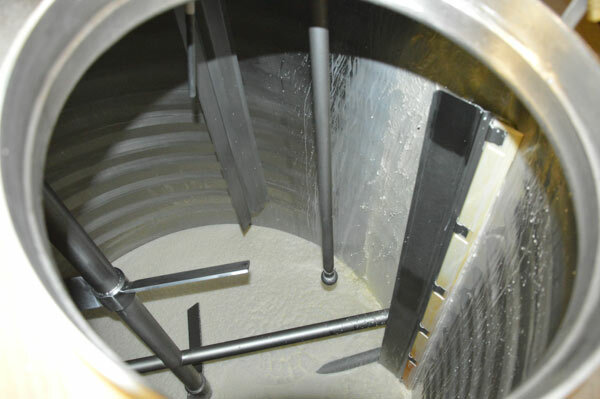 The rotation of the churn shakes up the fat cells and this separation allows the buttermilk to be extracted from the fat. The churning allows us to shape the butter. This step removes any buttermilk residue, as well as the acidic taste from the churned cream. Washing well also allows the butter to be conserved better. Then the beating: during this stage of the process, the butter is worked until an even texture, which can be moulded, is achieved. 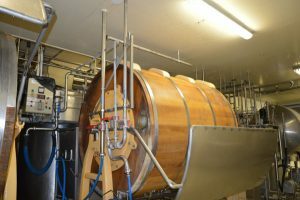 Once the butter comes out of the wooden churn, it is then sent to the packaging room to be put into different packaging. We are proud that this ancient expertise has allowed us to receive awards on a regular basis since 1902. In November 2015, our wood-churned AOP Charentes-Poitou were among those products selected for l’Excellence Française. 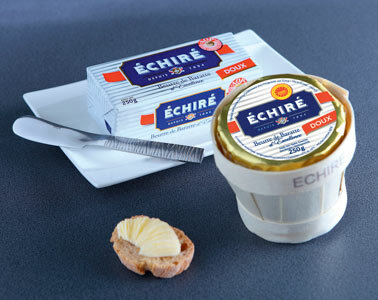 The AOP Echiré unsalted butter also won the gold medal at the Concours Général agricole en 2015. You can find our high-quality butters at your local dairy stockist, as well as at our two stores in Echiré and Celles-sur-Belle. L’Excellence Française was created in 2009 to honour companies which contribute towards the promotion of France throughout the globe through their expertise, creativity and innovative nature. Our high-quality Echiré 38% Thick Cream was awarded the gold medal at the Concours Général Agricole 2016. This thick and even cream will add an extra smoothness to all of your sauces. Its fresh milk taste offers a light hazelnut aroma and will add an extra element of quality to your recipes. 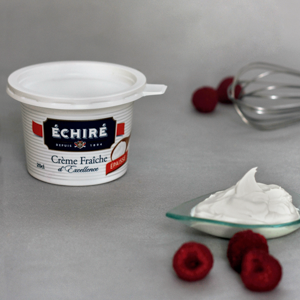 You can find our high-quality Echiré 38% Thick Cream in your local dairy stockist. Appellation d’Origine Protégée (AOP), previously known as Appellation d’Origine Contrôlée (AOC), was created in Europe in 1990. It refers to a product which has gained a certain notoriety, made in a defined geographical area and made according to traditional and well-known expertise. The products are inseparable from their regions and cannot be produced in other areas. 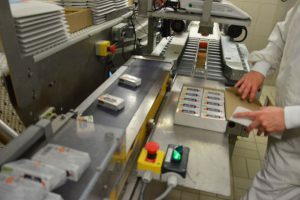 The production must take place in that specific region, according to detailed rules and regulations. The latter of which, being sufficiently comprehensive, guarantees the quality and taste of these AOP products for consumers. 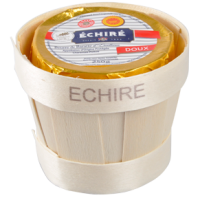 Our Echiré AOP butter is produced in wooden churns. This ancient expertise is a demonstration of quality, giving it a light and soft texture and making it perfect for puff pastry. Its natural qualities and unique taste make it the king od pastries. Discover our AOP Echiré butters here.